Why Do Cookies Become Soft If Left Out Overnight But Bread Like a Baguette Becomes Hard As Rock If Not Stored? Cookies or biscuits contain much more sugar and salt than bread like baguettes, which is the main reason why they become soft if left out. The finely divided sugar and salt are hygroscopic and soak up moisture from the atmosphere, the osmotic pressure in a sweet biscuit is quite high. The dense texture of a biscuit helps maintain the moisture by capillary effects. The baguette, on the other hand, contains little salt or sugar, and has a very open structure. The flour doesn’t care if there’s moisture around it or not. So, because of their different make-up, one attracts water, the other doesn’t. Try a series of different biscuits, varying from very sweet, dense ones to light, fluffy sponge biscuits. The “overnight sogginess index” increases with density and sugar or salt content. We have found that if we put both traditional Italian biscotti, not very sweet and fairly open-textured, and dense, sweet ginger biscuits in a sealed container, the biscotti go rock hard and the ginger biscuits end up very soft. A baguette dries out while a white sugar biscuit becomes soft because of the hygroscopicity of the white sugar in the biscuit. We researched this last year when entering a sugar biscuit competition. We were asked to produce a project about whether cookery was a science. The water vapour in the air is attracted to the sugar and this makes the biscuit softer. Baguettes however, have no sugar in them and therefore have nothing to attract the water vapour, which evaporates to leave the baguette hard. When we performed the experiment we used three types of biscuit: one made from caster sugar, another from honey, with the last being the control which had no sweetener. The control lost 2.17 grams of water after being left outside overnight, and the honey lost 2.03 grams, but the caster sugar biscuit gained 1.23 grams. The honey biscuit lost water because the atmosphere had a lower concentration of water than the biscuit. Starch consists of about 20 per cent amylose and 80 per cent amylopectin. The key to bread becoming stale is amylose retrogradation. Naturally, loss of moisture is involved or it wouldn’t dry out. 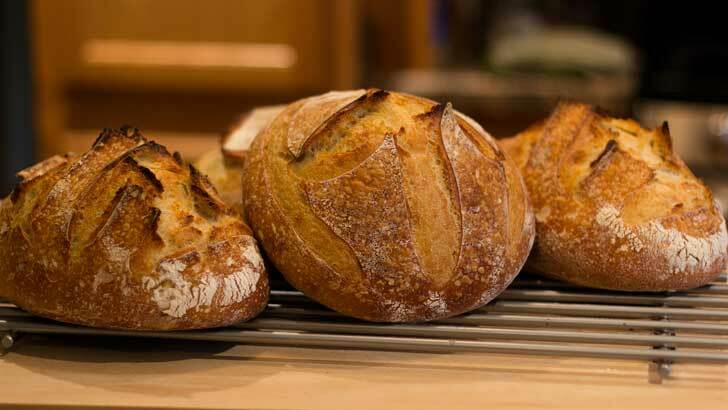 However, bread can be prevented from losing moisture and still go stale. The linear amylopectin molecules in the starch grains, which are separated by moisture in fresh bread, move closer together and become more ordered as the bread becomes stale making it stiffer. The process is temperature dependent, with the rate fastest at just above freezing and slow below freezing. Studies show that bread stored at average fridge temperature becomes stale at the same rate as bread stored at 30 °C. So putting bread in the fridge does not keep it fresher for longer. Here there is a difference between cakes and biscuits for tax purposes. This is important because cakes are subject to tax, while bread is not. Now we have a new definition: a biscuit is something which goes soft when left out, whereas a cake goes hard. What the implications are for tax on baguettes, we wouldn’t like to imagine. Are acid rock, country rock, and hard rock all geological terms before they were names for types of music genres? Why does Cooking Eggs Make them Hard but Cooking Potatoes Make them Soft? Why does Dairy Queen Soft-Serve Ice Cream become hard in the freezer and What is Ice Cream Made of?